Stainless Steel Balcony Railings - Foreman Fabricators, Inc.
A design-build firm asked Foreman Fabricators to make a cable fill railing for the Moto Europa Museum in downtown St Louis. We supplied the balcony rail structure using stainless steel components, and installation was handled by our customer. Beauty was key on this railing and a considerable amount of effort went into making the welds inconspicuous and then polishing them for a natural appearance. The designer had chosen stout components as necessary to withstand the tension from the cable infill, but in the end it made for a bold appearance on the overall product. The railing was so heavy that we had to press office workers into service when it came time to move the railings around for polishing in the shop. Foreman is the go-to choice when contractors need stainless steel railings of this type. Our extensive experience in measuring, designing drawings, rail fabrication and project coordination ultimately makes the contractor’s job easier. 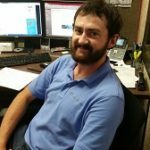 Alex has been featured in an Alumni Spotlight article on the Missouri State website. Way to go, Alex! 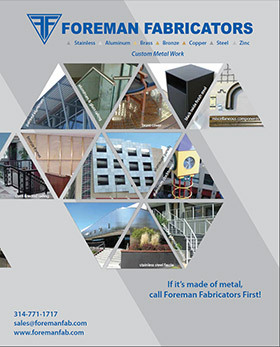 Foreman Fabricators has been an industry leader in custom metal fabrication since 1959. Whether you need a single one-of-a-kind metal item or thousands of them, Foreman Fabricators can make it to your exact specifications. We’re known for our commitment to being a top quality metal fabricator, and for working with our customers to get them exactly what they need, on budget and on time. Our talented team of project managers will help you every step of the way. From concept, to measurement, spec development, fabrication, delivery and even installation, Foreman Fabricators will help you get the job done right. One of a kind or quantity…since 1959! Copyright © 2012 Foreman Fabricators, Inc.. All Rights Reserved.